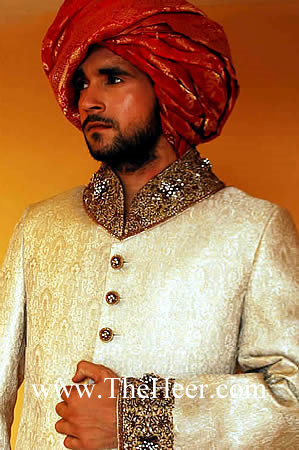 A beautiful sherwani in off white color and fabric jamawar. Super quality embellishments on collar and sleeves. Decorated button detail. Complimented with off white kurta and shalwar.Made in Pakistan. Click the button below to add the SW513 Off White Jamawar Sherwani to your wish list.